This phase of work on the campus of Meramec Bluffs was completed in May 2014 and included a 66,000 sq.ft. 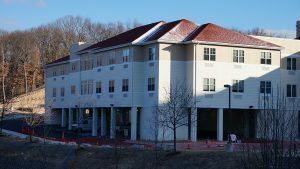 three-story skilled nursing facility. The facilities include: 44 single bed semiprivate, eight double bed semiprivate, 28 private rooms, five dining rooms, five living rooms, two kitchens, large community room, conference/family room, chapel, beauty salon, physical therapy/occupational therapy, arts and crafts, five screened porches, and a beautiful landscaped courtyard.